Big Bold sound from a very well crafted guitar at a very affordable Price. The Forte Port features Michael Kelly's special port technology. The top bracing and sound hole placement results in a noticeable improvement in sonic performance. The Forte Porte has a very bold sound. The guitar is very responsive and sounds like it should cost much more. The Forte Port features an aggressive cutaway giving you more fingerboard access and great balance. 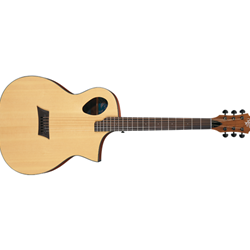 Its tonewood combination includes a solid spruce top and sapele body with mahogany neck and rosewood fingerboard. All of these this combine for a well-balanced, sweet sweet tone. When you need to plug in, onboard Fishman Sonitone Active electronics are designed to give a very accurate factsimilie of the guitars passive sound.